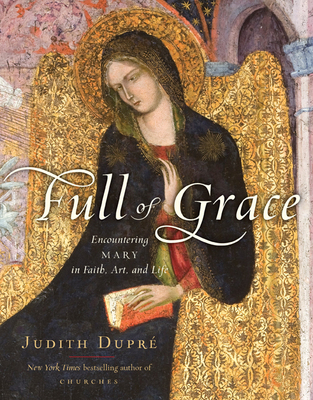 Writer Judith Dupré explores the range of the Virgin Mary’s incarnations in art. Architectural historian Judith Dupré is the author of Skyscrapers (1996), Bridges (1997) and the New York Times bestseller Churches (2001). Her latest book, Full of Grace: Encountering Mary in Faith, Life & Art (Random House, $40), represents a new departure in her work. Divided into 59 brief chapters, each representing a bead of the traditional Marian rosary, this amply illustrated volume explores the Virgin Mary’s place in the Bible, in history, in theology and in the wider culture. Speaking with Art & Antiques, Dupré discusses her multifaceted approach to this pivotal Christian figure. Full of Grace is quite different from your earlier books, which were largely concerned with specific building types, their history, their use and their evolution over time. Is your interest in Mary related to your architectural writing—and, if so, how? Churches was a pivotal book for me. It opened my eyes to the emotional attachment that we have to buildings. When I began writing about the eternal feminine in architecture and all those intangible qualities that move us—memory, beauty, procession—I realized that every topic I was considering hinged, in some way, on the Virgin Mary. We see this, among other places, in your discussion of the 18th-century pilgrimage church of St. Peter and Paul at Steinhausen, Germany. Steinhausen’s plan is arranged around an oval nave, which is conceived as an earthly paradise covered with fruits and vegetables made of gilded and polychrome stucco. This was the literal recreation of Jesus, the fruit of Mary’s womb. When the faithful enter that church and see the light streaming through the clear glass windows and piercing this flower-and-fruit-filled garden, they can feel as if they’re present at the very moment of the Incarnation. And just as Mary’s body was a divine vessel for the Christ child, the church becomes a container for transcendent exchange. The use of light as a metaphor for the incarnation was already well established by this point in other branches of the arts, for instance in Renaissance paintings of the Annunciation. Yes, we see the same thing in the Mérode Altarpiece [in The Cloisters]. In the central panel, a tiny homunculus comes through the window on a beam of light. Your eye travels around the painting, following the light in a circular path as it is carried from the folds of Mary’s dress to the figure of Gabriel and around again. There is an eternal circle. In the Mérode Altarpiece, Mary wears a sumptuous red gown and is surrounded by all the comforts of a well-appointed home. Robert Campin, Jan van Eyck, Rogier van der Weyden, Jan Gossaert and other artists of this period created Marian images in which a sense of luxury and opulence prevails. Why would a humble girl from Nazareth be depicted in this way? Once Mary was declared to be the Mother of God—Theotokos—at the Council of Ephesus, in 431, she assumed her role as the pinnacle of human creation. Over time elaborate liturgies, processions and feasts were created to honor her. And her persona became embroidered in art, sometimes literally, with gold and jewels and expensive paints such as ultramarine blue, which was made from lapis lazuli. When most people think of Mary, they think of a Renaissance queen, because her portrayal in art as the queen of heaven is so powerful and compelling. Hadn’t the ancient goddess Isis also been called “the Mother of God” and “the Great Virgin”? People tend to think goddesses were worshipped only in the very distant past, but at the time of the Council of Ephesus, there were still plenty of people worshipping Isis, Demeter and Artemis. In the 5th century, the Temple of Artemis drew tens of thousands to Ephesus every year. As Christianity became the dominant religion, the person of Mary subsumed those earlier identities as the archetypal great mother and the all-powerful virgin. And she also assimilated the symbolism associated with figures like Isis—the moon, the sea, the stars. Many Marian images were destroyed during the iconoclastic purges of the Protestant Reformation. Was this a way of enforcing the Biblical prohibition against idolatry? The theology of Luther, Calvin and Zwingli was based on sola scriptura, the authority of scripture alone. Mary’s scant mention in the New Testament—she is referenced only 13 times—meant that her veneration fell outside biblical authority. Mary was still honored: her willingness to bear the son of God was a model of faith. But asserting the centrality of Christ meant rejecting any special focus on his mother. Aside from any issues there may have been with Marian images—Calvin, in particular, railed against sensuous, bare-breasted portrayals of the Virgin—it was really the focus on scripture that caused a shift in the way Mary was viewed by Protestants. As you discuss in the book, Mary remains a force in the modern world—in faith, in art and in life. Your approach is diverse and to some extent unconventional. A subtext of this book is the notion of hybridity, the kaleidoscopic impact of the past and future on the present moment. Some of the essays in Full of Grace are straight history, while others examine theology and the controversies that surrounded the proclamation of various Marian doctrines over the years. But there are also stories that tie Mary’s life to contemporary concerns: parenthood, loss, divorce, creativity, the dignity of work. I find the figure of Joseph very interesting for that reason. The narrative about Joseph is about “showing up”—whether 2000 years ago or today, in 2010. Joseph is the earthly stand-in for God, Jesus’s father. He is a carpenter and makes things with his hands, just as God, the cosmic Creator, made all things. At one point, you relate the story of Joseph to a photograph by the contemporary artist Karen Ostrom. Karen Ostrom’s photo stopped me in my tracks. It depicts a glove maker relentlessly working, literally breathing life into the gloves, or hands, which will go on to create other works. It’s a secular iteration of the Creation myth and provides a new way of looking at Joseph’s role as both father and creator. I was especially impressed by the scope of the visual material in the book. I use a wide range of imagery to emphasize my belief that Mary is present right here, right now. I mix high art and low art, the popular and the sacred. There are familiar masterpieces like the Ghent Altarpiece, Michelangelo’s Pietà and Giotto’s frescoes at the Scrovegni chapel. There are movie stills and evocative works of contemporary art. Anselm Kiefer’s painting Jacob’s Dream incorporates a ladder as a prefiguration of Mary, mediating between heaven and earth. The book also includes images from the news, like Christoph Bangert’s photo of a Sudanese refugee baby, which to me conveys the spirit of a Nativity scene. Full of Grace is remarkable, I think, for giving a portrait of Mary not only as the figure familiar from church or from the Bible but as a beacon of inspiration and encouragement for a wide range of creative individuals throughout the world and throughout much of history. I’ve tried to show that Mary is a cultural figure because she sustains culture as she is recreated in the minds of the people who venerate her. Two thousand years after her brief life on earth, she is still very much alive.